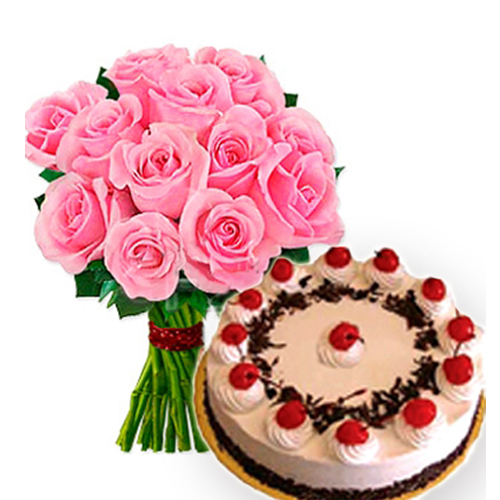 1 kg Round Shape Black Forest Cake Along with 12 Pink Roses Bouquet. 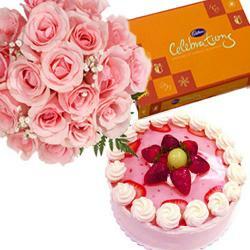 This love combo is sure to make perfect way to express your love. 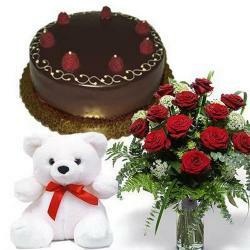 this gift hamper includes 12 pink roses bouquet with an 1 kg round shape black forest cake with the topping of cherries . 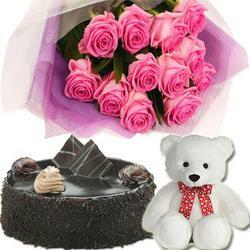 pink roses are one of the nice gift for expressing your emotions. the cake like black forest is totally decorated with white whipped cream , some chocolate ganache and it complet with the topping of cherries on it. 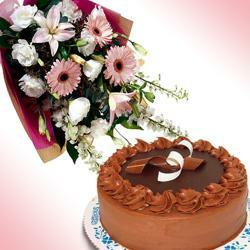 just order this gift through giftacrossindia.com & give a wonderful surprise to your loved ones on occasions like graduation , thank you , fathers day , Birthdays, diwali, Valentines day and anniversaries and many more as you wish.